HIPSTERS! Everybody knows one, nobody is one. These days, they are the only ethnic group that everybody gets to beat up on. Damn hipsters. Ruining the neighbourhood with their tight jeans, button down shirts, clear-lens Ray-Bans and polite ways. Dontcha' just hate 'em? 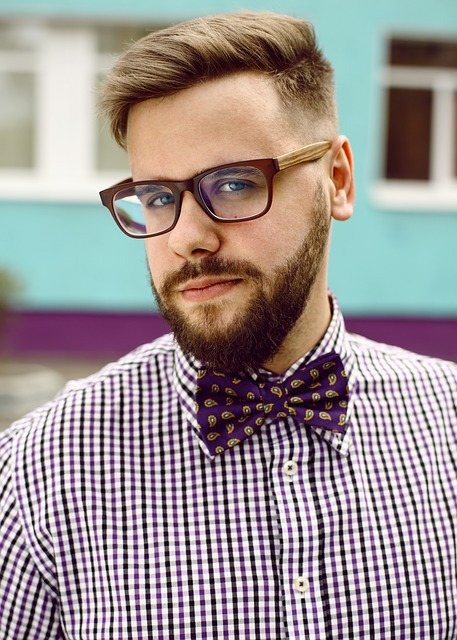 In London, to be hipster is to be a social pariah. You'll see suspiciously hipster-ish cafés with ironic "No Hipsters!" slogans chalked on their sandwich boards. Graffiti spray-painted on the walls of certain neighboods will warn "Hipsters Go Home!" or even "Death to Hipsters". Which is a bit much, try substituting "Muslims" or "Irish" into that particular sentiment and see how it reads. Ah Lads! Hipsters Are People Too! Tell people you going to Peckham, Shoreditch or Dalston for a drink or a bite to eat and you'll immediately get the "EW! THAT PLACE IS FULL OF F****G HIPSTERS!" Well, so what? I like hipsters. They're well groomed, normally harmless and fun to look at. Like Hamsters. Hamsters who know how to make a good flat-white. Yes, go to some parts of London and every guy under the age of 40 looks exactly the same. Which is a bit weird (we have definitely reached Peak Beard, people!). But you will also find some great bars. And great, cheap places to eat (hipsters being notoriously stingy). I have a friend (Martin from Tipperary) who has a workshop up in Hackney Wick. He moved in there just before the Olympics kicked off next door in Stratford. And Hackney Wick was a wasteland of old warehouses, crap-clogged canals and seriously dodgy back-streets. 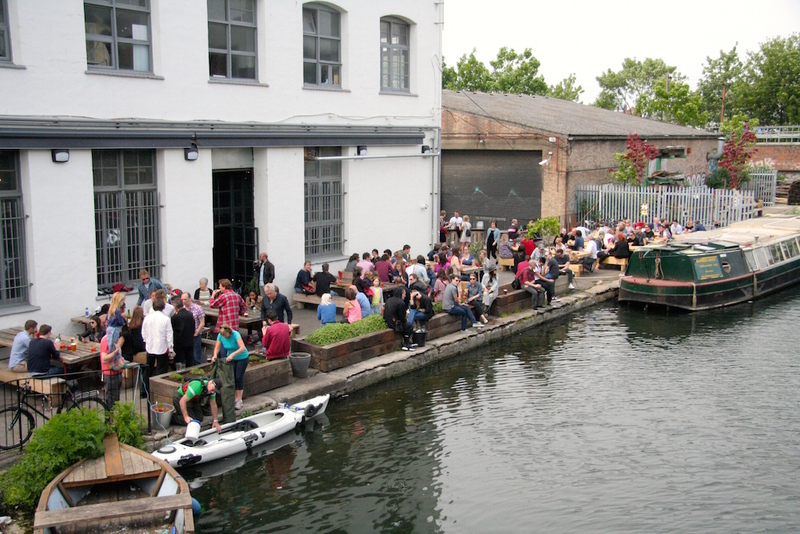 Now, Hackney Wick is one of the most stylish (well, Hipster-ish) parts of London. It's said to have the highest concentration of artists in London (they'll all be gone soon as the cool factor they brought to the 'hood sees rents and new loft apartments go up. Ironic or what?). The Crate, a former warehouse on the side of the canal that does greet beers and pizzas, is a great shop to visit when the sun is shining. You can actually do a great little pub crawl around Hackney Wick, there's a great pop-up bar called Grow, a cool restaurant bar called 90 Mainyard and yet another pop-up bar/theatre space (all old trestle tables and industrial space) in the same industrial estate that houses Crate. These are all within a stone's throw of each other. This is the view from Franks. Stunning. 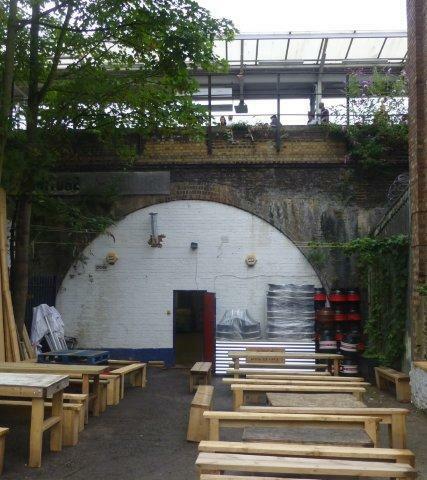 Nearby - you will find the Brick Brewery - a great little micro-brewery where you can buy a pint made virtually in front of you and sit on the trestle tables underneath the railway line in the yard. Also in the area - the Montpelier is worth a visit as is the relatively cheap and greatly heralded Italian restaurant, Artusi. The Effra - Great Place to Dance, Eat, Drink. The jewel in the crown is the Brixton Market - a fantastic indoor market crammed with tiny restaurants serving every kind of food under the sun, from Asian and African to French, South American and Mexican. It's absolutely hopping at the weekends, when it goes late night. Also worth a visit is the Effra Social - a former neighbourhood Conservative Club (a sort of social club) that closed it's doors in the late '80s and has recently re-opened as a lovely bar and gastropub. 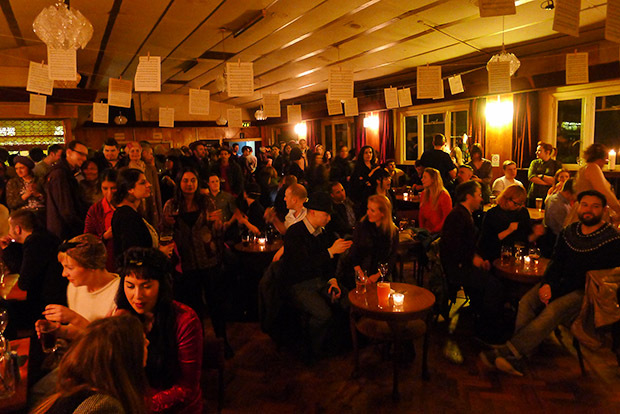 The Effra is unchanged since the doors closed on the old Conservative Club - there's a dance-hall at the back with a small stage for DJs and bands, it's a time-warp that the new owners have been smart enough to leave virtually untouched. You can almost picture your grandparents dancing to the sounds of Englebert Humperdink back in the day. Brixton is changing. Fast. People talk about gentrification and how the hipsters are ruining the place. Which is bollix. You can put up with some beardy blokes in tight-jeans if it means getting great food and places like the Effra. Yes, it's on the madly gentrified Columbia Road in the part of London that defines hipster - Shoreditch. And this old man's boozer has been transformed into the kind of gastropub-ish, shabby-chic hangout that drives some people crazy. But it's a beautifully preserved, Edwardian (?) pub with green majolica tiles on the outside and lots of cosy wood, glass and brass on the inside. A real survivor, thankfully given a second life. 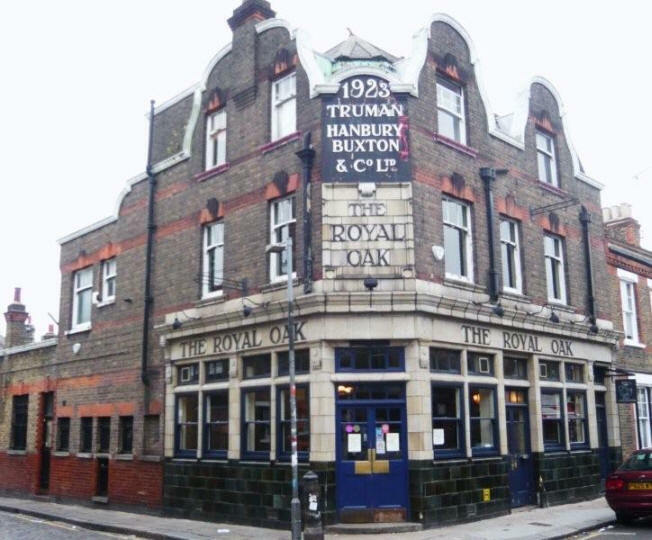 The only pub I'll include here that could not be accused of Hipster-ism - and the closest to the city centre, this Victorian Jewel is close to Covent Garden and the crowd is usually a mix of office workers, tourists and the odd local. 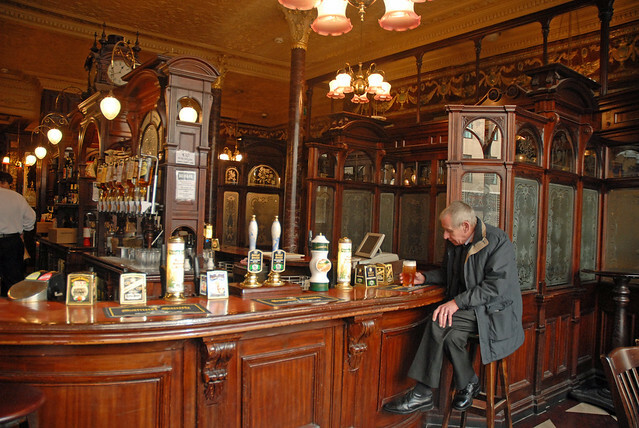 But if you are in the city centre, and looking for the authentic London Victorian Pub experience, this marvellous Gin Palace (in the true sense of the phrase) is the place to go. If you can't make it out to Dalston, Shoreditch, Hackney or Peckham, this is the place to go. * THANKS FOR READING AND HAPPY BOOZING.